Finding the right laundry detergent makes a huge difference to your household. There are a wide variety of detergents on the market, with many different types to choose from. Generally, the highest rated detergents are those in liquid form, as they are concentrated and often easier to work with. Your perfect detergent depends on your individual needs and preferences. For an eco-conscious 2019, many consumers want to find an environmentally friendly detergent. This could lessen the power required for each load, or that the detergent itself has a limited impact on the environment. Other factors affect your choice as well, such as whether you or any member of your family has sensitive skin or plays a sport. Even the smell of the laundry detergent makes a difference when it comes to finding your top brand choice for 2019. Start your search by looking at some of the highest rated laundry detergents listed below. Tide Coldwater Clean is one of the highest ranked detergents available. It is not only effective at removing dirt and stains but is suitable for washing entirely on cold water. This saves a great deal of energy by not heating your laundry load which cuts down on your carbon footprint. It is preferred for sensitive fabrics or loose dyes that cannot be put through a warm wash. Tide free and gentle is a popular option for those with sensitive skin. It is gentle and fragrance free, but still effective at cleaning. Tide PureClean is a newer option for those who are interested in reducing their environmental impact. While not all the ingredients are plant-based and environmentally friendly, it is much greener than other Tide products, with comparable cleaning power. Tide pods are a good option if you are interested in the mess free option of laundry pods. These enable you to benefit from liquid detergent without the risk of spills. This is a relatively new product to the U.S. but is highly rated on its effectiveness. Some consider it one of the best options at removing tough stains from clothing, while remaining relatively gentle on your skin. Those who live in very active households may find Persil is a good choice for dealing with their laundry after sports games and strenuous workouts. It is slightly more expensive than other popular brands but is one of the best options if your central priority is stain removal. Persil ProClean is generally the highest rated product from this brand as it deeply cleans your lines without stripping the material. Many eco-friendly detergents may be considered less effective than the average household requires. Seventh Generation, however, is considered one of the best green detergents on the market. The company is known for its environmentally friendly corporate policies, including using recycled plastic in its packaging. Purchase concentrated detergent for an even smaller carbon footprint if you are displeased with the most popular brands available currently. The effectiveness of this detergent is on par with less environmentally friendly brands, offering an excellent option for those looking at greener alternatives for 2019. Method’s products provide a combination of tough cleaning power and a lower carbon footprint. Concentrated detergents are often favored by those who want to cut down on excess packaging, and Method’s 8x concentrated detergent provides an extremely efficient solution in this regard. The 8x concentrated detergent is effective at removing dirt and stains, while still providing a practical use for every day cleaning needs. The bottles come with a pump you can use to precisely measure the detergent for each load, which prevents spills. Purchase refills in bags instead of another bottle if you want to cut down on your environmental waste even further. Other popular Method products include the 4x concentrated detergent, which is less expensive, but offers an effective clean. Eco-conscious consumers may be interested in the brand’s use of recycled plastic in their packaging as well. Mrs. Meyer’s detergent is known for its combination of effective cleaning and environmental friendliness. Many of the ingredients are plant-based, and the detergent is twice as concentrated as the leading competitor’s products. The gentleness of its ingredients makes this a good choice for those with allergies or sensitive skin. It still effectively removes dirt, stains and odors more effectively than many other green products. This detergent is available to purchase in bulk, allowing you to cut costs on individual loads. Consumers can choose between several botanically based scents such as citrus, lavender or basil. This detergent is noticeably different to other popular types of detergent, as it is in powdered form. While Charlie’s soap may not be considered the most powerful when it comes to stain removal, it is the top choice for those who are concerned about sensitivity and eco-friendliness. The detergent is biodegradable, suitable for those aiming for a greener 2019. It lacks the unpleasant scent often accompanying other powdered detergents. 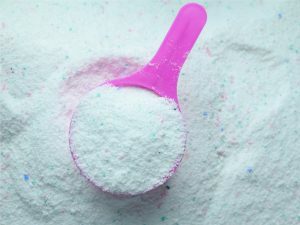 If you still prefer a liquid detergent, the company makes a liquid variety of the product featuring the same qualities as the powdered option. It is environmentally friendly, hypoallergenic, and allows your clothes to have a longer life than they would with harsher detergents. This detergent is effective at removing dirt and stains, but one of its biggest draws for users is its scent. The pleasant scent is popular with consumers and makes your laundry smell as fresh as possible. Not only does the detergent itself smell good while in use, but the scent transfers to the clothes you have placed in the laundry, helping to remove any underlying odors. Gain detergent pods and Gain Flings provide a good choice for those interested in the convenience of pods as well as freshly scented laundry. Gain OxiBoost is another popular product. It has its own appealing scent and offers an extra cleaning power when removing stains. This product has the added benefit of being suitable for cold water washes which helps keep the utility bills down.